So many grammar rules to teach the hoodlums, so little time. Do YOU know what the difference is in those three words? Because none of my sophomores do. I was deeply immersed in a fascinating discussion of possessives and apostrophes, trying to teach those youngsters how to master their writing. "Now, for the hardest rule, when an apostrophe comes AFTER the "S". There are a couple of occurrences for this one. The first one is if the person or thing end in "S" to begin with. Does anyone in here have a name that ends in "S"? I looked around the room: Melissa, Jordan, Baylee, Austin, no names that ended in S.
"Well my name is Gracccccccccccccccccccccccce.........", with special emphasis on the S sound. We all looked at her. Others started to softly giggle at her error. The laughter grew louder. I joined in. Grace chuckled too. Before we knew it, we were all laughing . "You do realize that your name doesn't acually end in an "s", right Grace?" I questioned, once I had controlled myself. She smiled and replied, "Oh." Ah, sophomores. They are truly the light of my life. 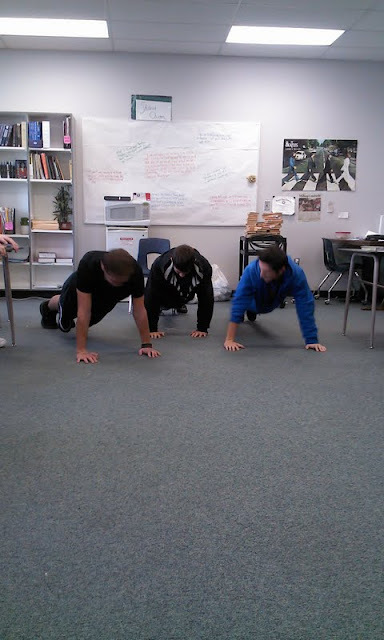 Pushups. This is proof that I can convince sophomores to do anything. Oh, I cannot wait for the day when I have my own group of sophomores that I can subject to my grammar nazi-ness. Yeah, just made that a word. I'm sure this is only the tip of the iceberg! Too funny! Popped in to say hi! I love this! Haha, at least she points for creativity!!! Hope you're having an amazing time in Vegas right at this moment! NICE! My sophomore boys have sword fights with rulers in interior design, a class they took because a girl made them. They drive me NUTS, but I love them so much. Oh geez. Grammar stuff drives me nuts and I'm an engineer (engineers are notoriously bad at all things not math related), I can't imagine how hard it must be to be an English teacher. haha hilarious. that sounds like something one of my little ones would have said.